Elkhart In. : Dr. Miles Medical Co. , 1902. 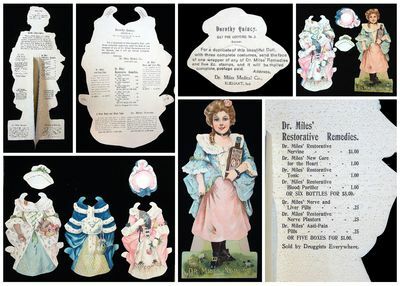 A 20 3/4" tall die-cut easel back paper doll depicting Dorothy (Dolly) Quincy holding a bottle of Dr. Miles Restorative Nervine. The reverse introduces Dolly, the future wife of John Hancock and of course promoting the various Dr. Miles with brief narratives and a complete product listing including pricing. Also includes three costumes and hats. The costumes are identified e.g. the gown she wore when first she met John Hancock. Each costume has product information on the reverse. Includes original mailer from Dr. Miles Medical Co.